Mobile phone manufacturer Samsung now enjoys the same level of rumours and speculation regarding new hardware in a similar way to what Apple does, and recently there has been a lot of talk of some supersized handsets away from its popular Galaxy Note range. Today we have news that pre-orders have already started for the Samsung Galaxy Mega 6.3 with pricing. Samsung is set to launch both the Galaxy Mega 5.8 and Mega 6.3 at some point in the future, but all we have heard so far is rumours about both devices with nothing official from the company itself. 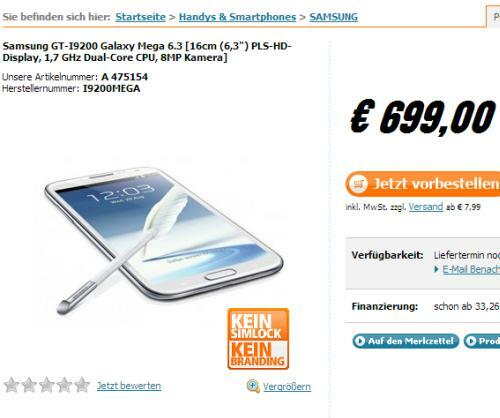 Now before the company officially launches the two devices a German website has the Galaxy Mega 6.3 up for pre-order already with the price set at â‚¬699. Obviously the product listing has no expected delivery date for the device and you have to wonder if the pricing will change once the device is officially announced. To recap what is known about the device so far is that it will feature a 6.3-inch HD PLS touchscreen display powered by a dual core processor clocked at 1.7GHz. There is also set to be 1.5GB of RAM with an 8-megapixel rear facing shooter coupled with a 2-megapixel unit in the front. Connectivity wise there is Wi-Fi 80211 a/b/g/n, A-GPS, and Bluetooth 4.0 with a 3,200 mAh battery unit packed into a form factor measuring 167.6mm x 88mm x 7.9mm. It is still not known whether the handset will come running Android 4.1.2 Jelly Bean or 4.2.2 out of the box. Will you be considering the Samsung Galaxy Mega 6.3? Source: notebooksbilliger.de via Google Translate.